Brian Martins submitted this photo and caption. Attached is a photo taken on my return with my squadron from our tour of the Persian Gulf. I aged out with the Spartans Drum and Bugle Corps in 1998 joining the United States Navy after a great year winning our second Drum Corps International Division II Championship title. 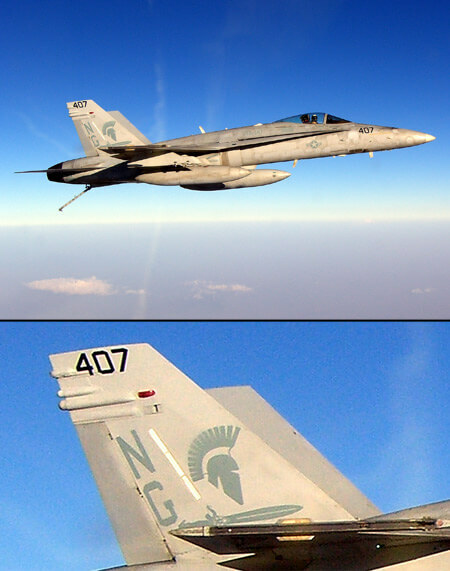 When in the Navy, I was attached to Strike Fighter Squadron 147 – known as the Argonauts – and needed to paint an image on the vertical stabilizers that symbolized Greek mythology. So I grabbed my Spartans corps jacket, enlarge it and painted the Spartans logo with a sword underneath on 15 fighter aircraft that are flying protecting our freedom. The Argonauts were registered as the best West Coast Navy Fighter Squadron for two straight years.